Charlie Anderson, editor of Sussex Jazz Magazine, shouts it out for the local talent on the Love Supreme Festival's Bandstand stage - and for a little bit of Paradigm Shift. Since its first appearance in 2013 the Love Supreme Festival has represented local, Sussex-based jazz musicians on the Bandstand stage, programmed by Jack Kendon and Eddie Myer of New Generation Jazz, who have both done amazing work in bringing young artists to The Verdict jazz club in Brighton. The new generation of jazz was well represented this year, even more so than previous years, with young guitar trio Cesca and teenage trio Zeñel performing on the Bandstand, often to festival-goers keen to avoid the cacophony of multiple stages catering to a crowd of nearly 30,000 people. The Arena stage, which primarily showcases contemporary jazz, also featured an interesting crop of the new generation of British musicians including Howes3, a new trio of pianist Oli Howe, bassist Andre Fry and drummer Pete Hill, who have been building on their successful gig at Jazz Re:Freshed back in April. At Love Supreme they played a set of highly original, new music and featured a guest appearance from star vocalist Abi Flynn, who took time off from her chemotherapy treatment to spread her love and positivity with a piece that she had co-written with Oli Howe, entitled Yes. Saturday at The Arena saw Jake Long’s MAISHA appear. There was some superb saxophone and flute playing by Nubya Garcia and the energetic guitar playing of fellow Nerija member Shirley Tetteh got the crowd jumping. Young and talented pianist Ashley Henry also provided something different to the usual soul-jazz and jazz-fusion common at this festival. 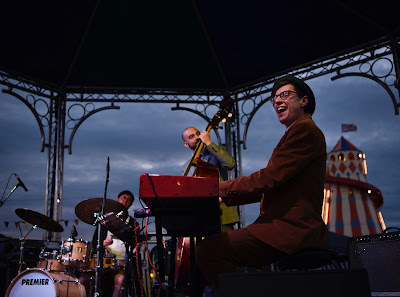 Saturday evening provided the highlight of the Bandstand’s varied array of artists with young pianist Dave Drake performing in a trio with Italian bassist Dario De Lecce and drummer Pete Hill. Billed at the same time as Herbie Hancock, the young pianist did brilliantly and appealed to an audience that managed to escape the overcrowding at the Big Top as people struggled to catch a glimpse of the jazz legend. Drake began with one of Monk’s more obscure pieces, entitled Thelonious, before performing a lively original blues composition. 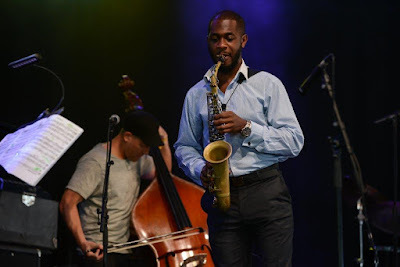 After a tribute to Coltrane (in the form of Coltrane’s tribute to Sonny Rollins, Like Sonny) Drake launched into his personalised rendition of the Billy Taylor classic I Wish I Knew How It Would Feel To Be Free. He then ended with a superb slice of hard bop in the form of Wayne Shorter classic One By One, featuring some beautiful soloing from bassist Dario De Lecce. Bassist Terry Pack performed with his 'unfeasibly large ensemble' Trees, who were too big for the Bandstand stage, with new original compositions and arrangements from their new album Heart of Oak. Afterwards, Sam Barnett, a 16-year-old saxophonist, gave an impressive bebop-themed set (he is currently fundraising for money to study at the Basel Jazzcampus in Switzerland). There's so much on offer at the Love Supreme Festival that it's hard to catch everything. Having seen Michael Janisch perform before I had decided to check out Barnett before getting some much needed falafel. Whilst queuing for food I could hear some amazing alto sax playing, so I ventured into the Big Top tent to see Nathaniel Facey soloing on what was, sadly, the final number of Paradigm Shift's set. From the little that I heard, I wish I'd seen their whole set. Sussex pianist John Donaldson brought a local version of his Hexagonal ensemble, aptly entitled Mostly McCoy and Mseleku, to the Bandstand followed by bassist George Trebar’s Nighthawks who performed a range of hard bop tunes and originals. The Bandstand finished on Sunday night with the superb young saxophonist Alex Hitchcock, ending another successful year for the Bandstand stage at Love Supreme.